Sometimes I like to take the long way to work, so I can squeeze in a bit of exercise and adventure before I am forced into manual labour for minimum wage (okay, it's not that bad..a little above average). One particular day, I decided I'd come in a good 2 hours early so that I could treat myself to a nice lunch in the city. As always, I was wrought with decisions - did I want to go for that delicious looking chicken baguette from that cute little store people queue up for ages in front of, down Degraves Street? But its a whole baguette, and bread is bad. Or should I get sushi? But I had sushi yesterday. Maybe I should just get some soup from In A Rush? But I want something substantial that will fill me up. I honestly have this argument with myself over and over, and I think it has something to do with the fact that I am a perfectionist and I want each meal to be fulfilling and delicious at the same time. Luckily for me though, this day I would find myself wandering up Little Bourke Street where I would catch a glimpse of this sweet little treasure that promises just this, and more! When you walk in, the smell of freshly baked potatoes fills your lungs. None of those greasy, oily, potato chips - I'm talking real, authentic, spuds - baked in the oven, and then sprinkled with your favourite toppings. There are options for everyone - the vegan, the vego, the meat lover, as well as the health freak like me. 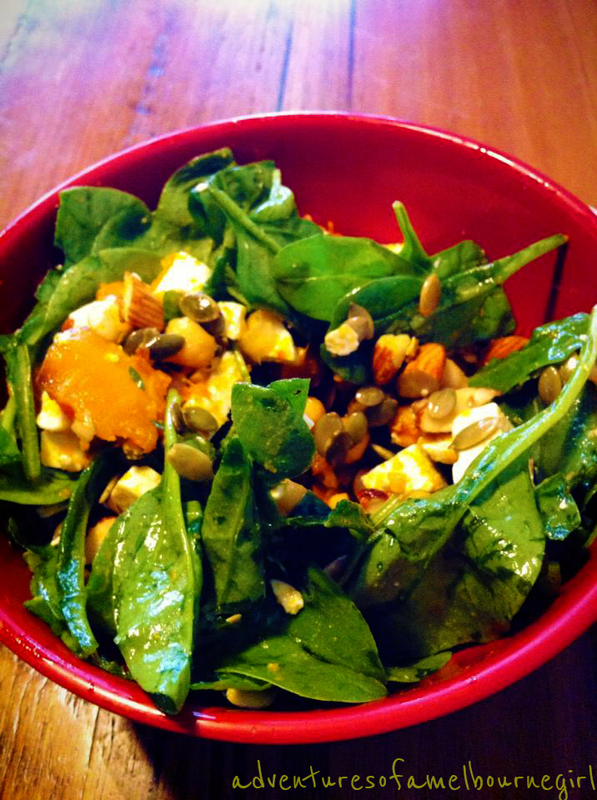 Staying true to my nature, this day I opted for the Roast Pumpkin and Feta Salad with wild rocket, baby spinach, pumpkin seeds, chickpeas, almonds & kasoundi. If you eat in, you pay a little extra for the cute, homely looking bowl they serve it in - but I prefer the art on the take away boxes, and have only ordered take away ever since. The pumpkin was sweet and tender, and harmoniously balanced out by the spice of the kasoundi and bitterness of the feta. Jam-packed with nutrients, and filled to the brim so that it's quite literally overflowing - you most definitely get your money's worth here - and it has remained one of my favourite lunch break spots ever since!